The Newcastle to Amsterdam route connects Newcastle upon Tyne in North East England to the port of Amsterdam Ijmuiden in Holland. The port is located 30 miles from Amsterdam. The ferry route is operated by DFDS Seaways. There are up to 7 crossings per week and the crossing time is approximately 16 hours and 30 minutes. This route accepts foot passengers and all vehicle types. Sailing from Newcastle to Amsterdam is a fantastic way of getting to the heart of Holland, especially if you want to bring your car with you. Please take note that the port in Amsterdam is called IJmuiden. It is North East of the city and has a tram station outside making it easy to reach the city centre. 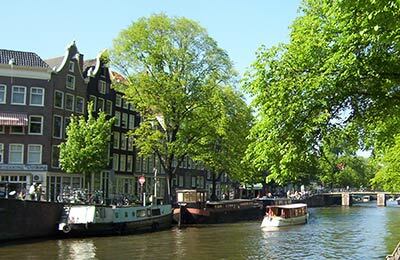 Amsterdam is an interesting and cultural city, and offers something for everyone to enjoy. 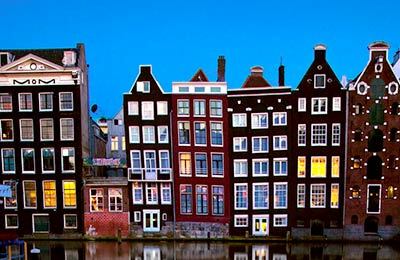 Visit the Anne Frank museum for a history lesson, take a tour of the Heineken museum and enjoy the buzzing nightlife that surrounds Amsterdam. This route is operated by DFDS Seaways and has a journey time of 15 hours and 30 minutes. Sailings on this route are made overnight. This gives you time to have some dinner in the restaurant, retire to your cabin for a good nights sleep, and wake up in the morning ready for your journey ahead. See below for our current lowest prices and departures. Use the search engine to find the best price for your requirements. With AFerry we always give you our best prices for ferries from Newcastle to IJmuiden. No matter which page you book from we always include all our special offers. And there is no need to look for a discount code. If we have an offer available, your ferry price will include the reduction or offer. There's no need to look at other websites. If you're not sure if the Newcastle to IJmuiden route is right for you or you can't decide between ferry companies, if there is more than one, you might also find it useful to read any reviews we have available. We ask all our customers to send us reviews for Newcastle to IJmuiden ferries. Remember though, that the earlier you book, the cheaper prices normally are. So don't spend too long deciding! Newcastle to IJmuiden is a popular route, so we advise you to book as soon as possible. Fast check in and polite staff. Onboard the room was clean tidy and well presented. Catering offers a good selection albeit a bit pricy. Overall a nice crossing. This is far more relaxing than flying and European road systems seem to run more freely than in the UK. With modern GPS navigation is simple and the holiday starts earlier - without endless airport queues and security checks! Was a really great experience loved it. Check-in at Newcastle was easy and very well organised as was both the offloading and check-in at IJmuiden. However, offloading at Newcastle was painful in the extreme exacerbated by driver who did not get to their car before disembarking was underway and hence significantly held up unloading. But the biggest delay was UK Borders Agency who were slow in the extreme with leaving the port area taking over one hour. Although onboard prices are a bit high for your dinner and drinks, it is of the highest quality. The buffet at 29 Euro seems pricey, but the food available in the Bistro is superb. Lots of choice made to perfection. Staff is generally very friendly. Cinema is small and basic, where they play a DVD for you projected on a screen. DJ is friendly and willing to play requests and the live band is excellent! The cabins are small but comfortable, beds are clean and comfy and you have your own toilet and shower with towels provided. All in I enjoyed the journey back and forth.